“Parting on Z” is real–time virtual interactive puppetry that responds to the puppeteer’s voice and walking balance, integrated with the traditional Korean oral storytelling known as Pansori. The story chosen for this performance is the farewell scene from Chunhyang-Ga (춘향가), the oldest pansori text and one of Korea’s best known stories about love, separation and reunion. This farewell scene demonstrates the extreme emotional state of constraints called han (한). Han is a paradoxical state of consciousness that combines the extreme state of grief caused by physical or mental constraints with a great hope and strong desire for overcoming the situation. It is a fundamental driving source of transformative rituals in Korean shamanism. 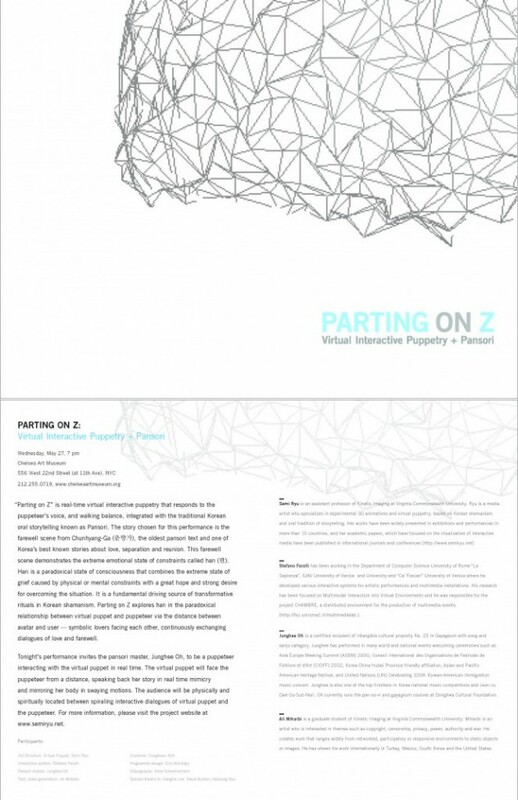 “Parting on Z” explores han in the paradoxical relationship between virtual puppet and puppeteer via the distance between avatar and user—symbolic lovers facing each other, continuously exchanging dialogues of love and farewell. Tonight’s performance invites the pansori master, Junghee Oh, to be a puppeteer interacting with the virtual puppet in real time. The virtual puppet will face the puppeteer from a distance, speaking back her story in real time mimicry and mirroring her body in swaying motions. The audience will be physically and spiritually located between spiraling interactive dialogues of the virtual puppet and the puppeteer.